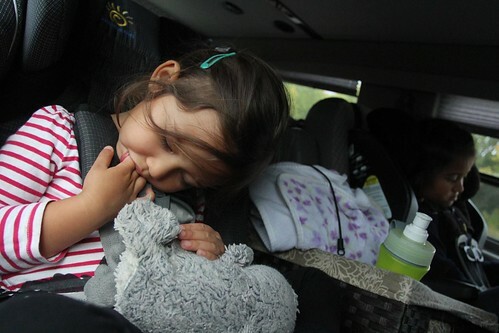 Mali Mish - Day 49: Off to Sheboygan for a glimpse of Lake Michigan. Even though the storm has subsided, it is still mostly overcast so we are still not getting any decent amperage coming through the 100-watt solar panels. But since we had a full night’s charge, we should be ok to boondock again tonight. That is good news since the plan today is to head into Sheboygan to do just that. 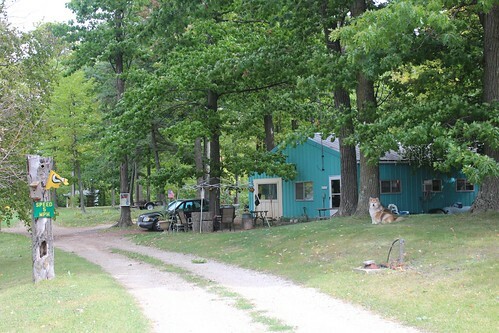 We filled up our water tank and used the dump station and bid farewell to Shady Acres Campground. I can say that this is a place I wouldn’t recommend to anyone because it looks more like a refugee camp than an RV resort, but it was just the kind of place we needed. A place to charge up and a place where we can be pretty much left alone and check out at our leisure. That means we got out of here at pretty close to 2pm. 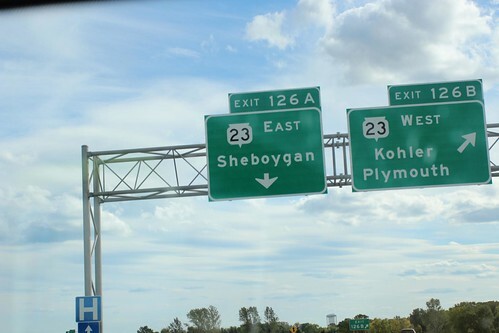 The drive to Sheboygan is a short one from Denmark, Wisconsin. 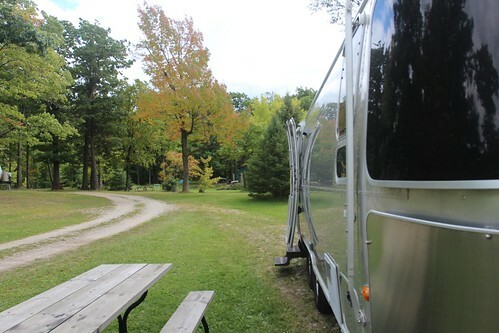 When we chose Shade Acres campground, we had today’s drive in mind since it already puts us 15 miles closer to our next destination. At just about 50 miles, it didn’t feel much like a transit day today. During most transit days, Mila gets to take her afternoon nap that she has been skipping ever since we left California about 2 months ago. We made it to Sheboygan in no time and had half of the afternoon left to do some loitering around. We had not done much research before we got here and didn’t really know what there is to see. 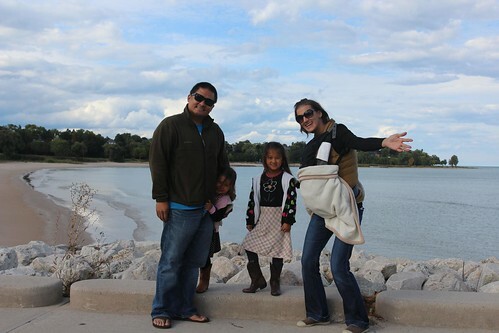 One thing we did know is that Sheboygan is right on Lake Michigan so we decided to head down to the waterfront and maybe dip our toes in the cold water. We found a nice park near downtown called Deland Park. 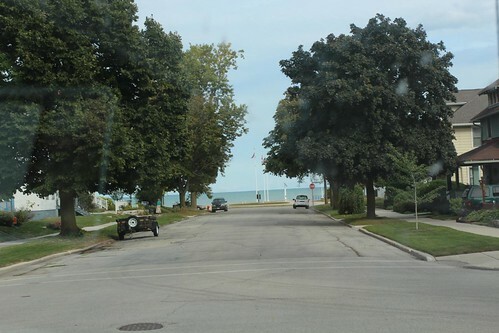 It is right next to the marina and has beaches, playgrounds and large grassy fields all next to a mostly empty parking lot. 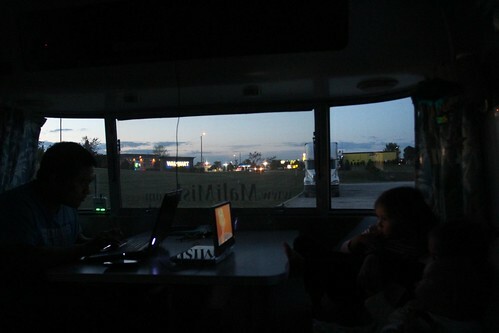 On transit days we usually drive as far as we need to and hangout in our chosen overnight parking lot. Having this as an option today was a really refreshing change. We took a family portrait by setting the camera on top of a trash bin in front of the beaches of Deland Park. Marlene is probably not real thrilled that I posted this photo since I was suppose to stick my arms out too during the photo but for some reason I chose to let her have all the glory. As much as I like to blame the clouds for limiting our boondocking capabilities in the last few days, it does make for a stunning photo op. 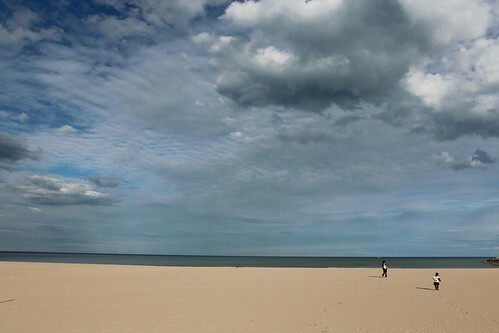 It is kind of strange for us to be at a beach and a body of water that seems to be a ocean. Since obviously it is not an ocean but rather a fresh water lake, there is no salty air that our olfactory sense are expecting. 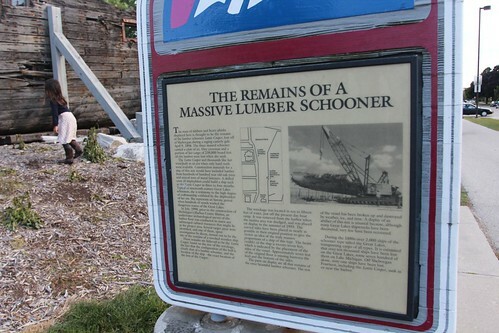 One of the unique exhibits here at Deland Park is the remains of a lumber schooner that shipwrecked here over 100 years ago. The wreckage was found while dredging the harbor and has been carefully reconstructed to the best of their abilities. 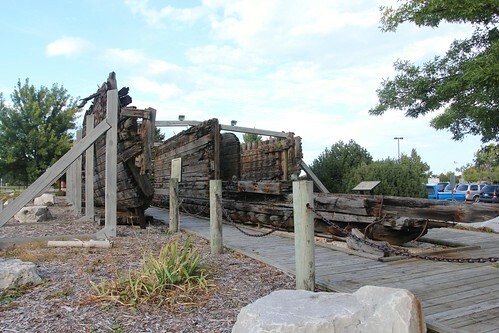 Wooden schooners like these were made all up and down the coast of Lake Michigan that was used for shipping freight all around the Great Lakes. Rock hard, solid white oak was abundant around here and was used extensively on these vessels. Shipbuilders got so good at making these boats, one can be completed in just a matter of weeks. Of course that level of skill has been long lost since modern ship building materials and techniques were implemented. 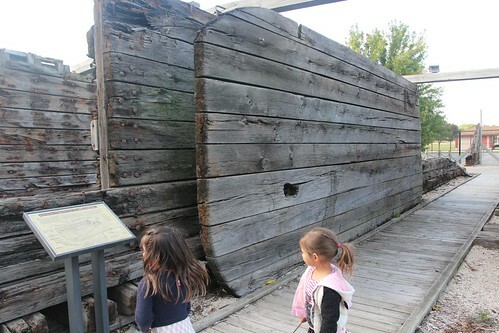 The centerboard of the schooner is on display here and is actually in pretty remarkable shape. The hole you see in the centerboard just above Mila’s head is where the board would have pivoted as it was raised of lowered in and out of the trunk. You can still see the marks on the hull of the boat as well as part of the chain that was used to lift it board in the upper rear corner. After a few hours in Deland Park, we decided to head over to our overnight spot before sunset. 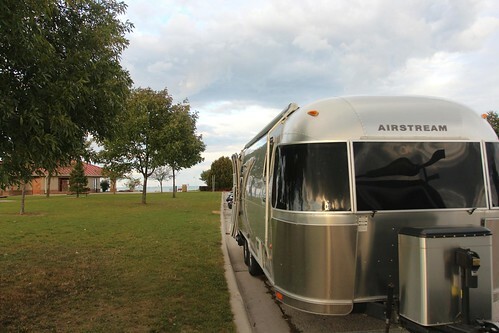 Our research told us that of the two Walmarts, only the one south of downtown Sheboygan was RV friendly. 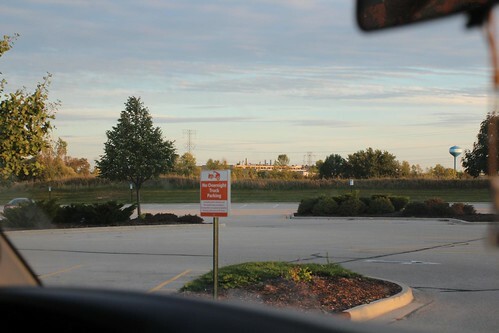 When we pulled up however, we did see these ‘No Overnight Truck Parking’ signs everywhere. There must be a city ordinance on overnight parking here but since there were already a handful of other big rigs here, we found a spot and settled in for the night. Tomorrow we will do some more exploring and see just how long we want to stay in the Sheboygan area. 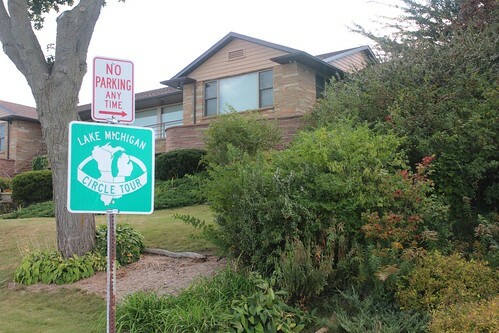 2 Responses to Day 49: Off to Sheboygan for a glimpse of Lake Michigan. It’s so funny to see so many familiar sights! I wish I would have seen this post when you were still here because I could have given you some recommendations on things to do. It looks like you found your way around pretty well, though! Thanks Molly! We had somewhat limited time there but we did squeeze it some cool places to see. We were staying with the famly who lives right next to where we parked so they gave us lots of recommendations. Wish we could have stayed longer and maybe we will come thru here another time.